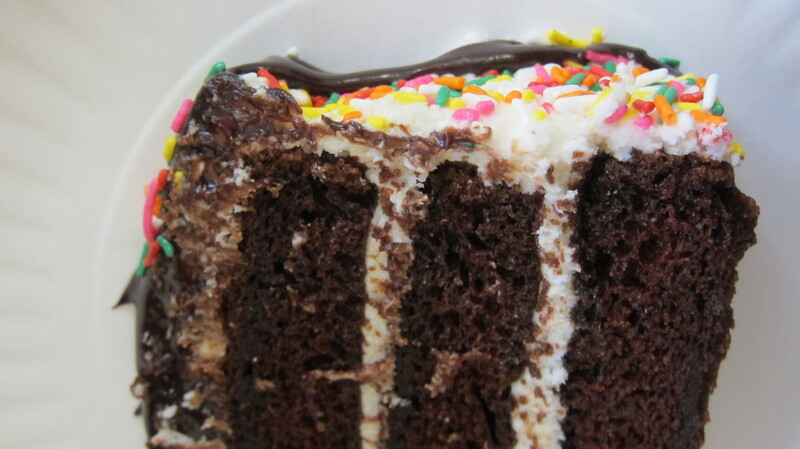 When I sat down on the bus this morning with this cake in my lap, two young girls behind me (around 9 or 10 years old) whispered to each other, “That’s a yummy-looking cake!” I smiled, turned around, and said, “I made it for my friend’s birthday! 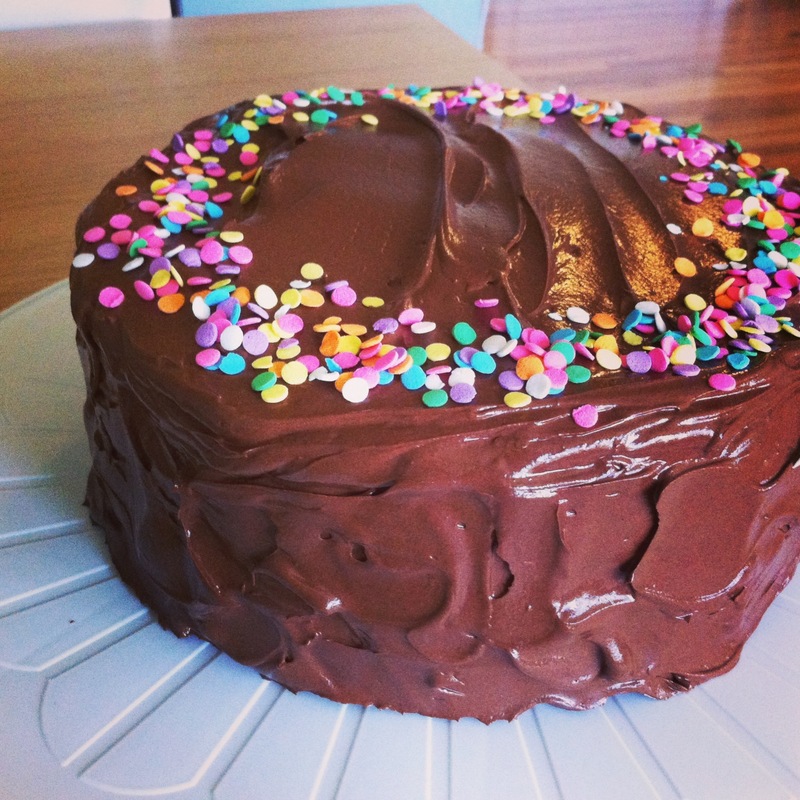 It’s a yellow cake with chocolate frosting!” They grinned at me and started chattering away. 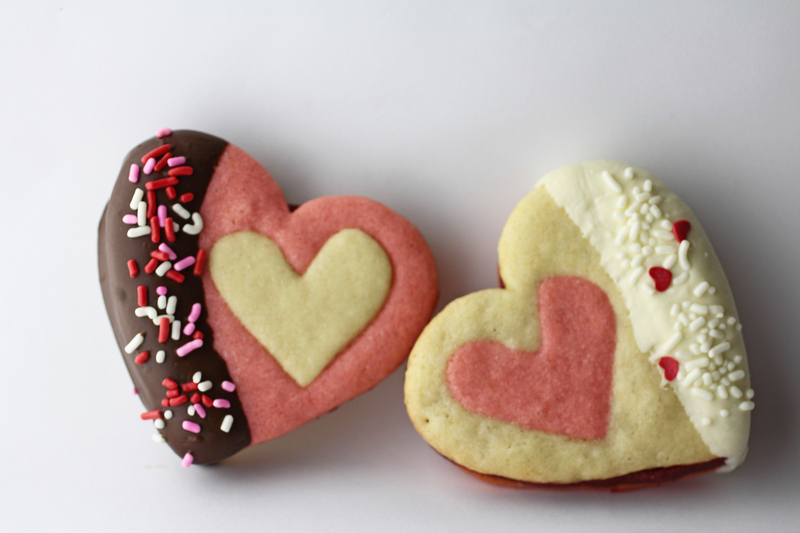 One of the girls, a cutie with chin-length brown hair and a smattering of freckles, told me about the desserts she’s made with her mom: a yellow cake, a chocolate cake, and chocolate chip cookies with strawberries (um, what?!). I told her I had never added strawberries to my cookies before, but that I would give it a try, and she lit up at that idea. She then offered, “You wanna know the secret to the best cakes and cookies no matter what?” She leaned closer to me conspiratorially and announced, “Lemon and vanilla! You just add lemon and vanilla to everything, even if it doesn’t call for it. That’s the way you get the best cakes!” I asked her a few more questions about this surprising secret, then turned to her friend who had been mostly silent up until now. This adorable girl, with curly blonde hair and petite glasses framing her big eyes, excitedly shared that her mom was “a CHEF! !” and could make “everything – cakes, pastries, cookies, pies, and lots of other things!” We chatted about her mom’s talents for a bit, and then another girl of about 16 or 17 years (I believe she was working the summer camp that these two were part of) chimed in that she had “made a chocolate cake with beets, and you couldn’t even taste the beets, it was just really moist and dense and awesome!” And just like that, the four of us were having a conversation – on a bus – about everything. The summer camp they were a part of, the languages they spoke, how I’m an engineer for work and baker by hobby, the best desserts we’ve ever had… My favorite part of all of this was how obvious it was that the preparation and eating of food had formed bonds, inspired admiration, and caused excitement in these girls’ lives. How happy they were, and how comfortable it was, to have a conversation with a stranger on the bus, all because of a cake! And the thing is, this isn’t even the first time I’ve had people comment on my desserts. It’s nearly impossible to make the trek from apartment to work without having at least one random person comment on or joke about whatever I’m carrying. “Is that for me?” “How thoughtful – you knew it was my birthday!” “What kind of cake is that?” “Oh wow, that looks delicious!” “You’re going to share with me, right?” “What’s that for?” “Did you make that?” “I should probably taste test that for you…” “I’m so jealous of whoever gets that!” Clearly, there’s something about desserts that allows people to let down their guard and interact. Something that tips them off that it’s okay to talk, that no one’s going to look at them strangely or brush them off or turn away if they strike up a conversation. This is the power of cake. It makes strangers into friends, if only for the duration of a morning commute. 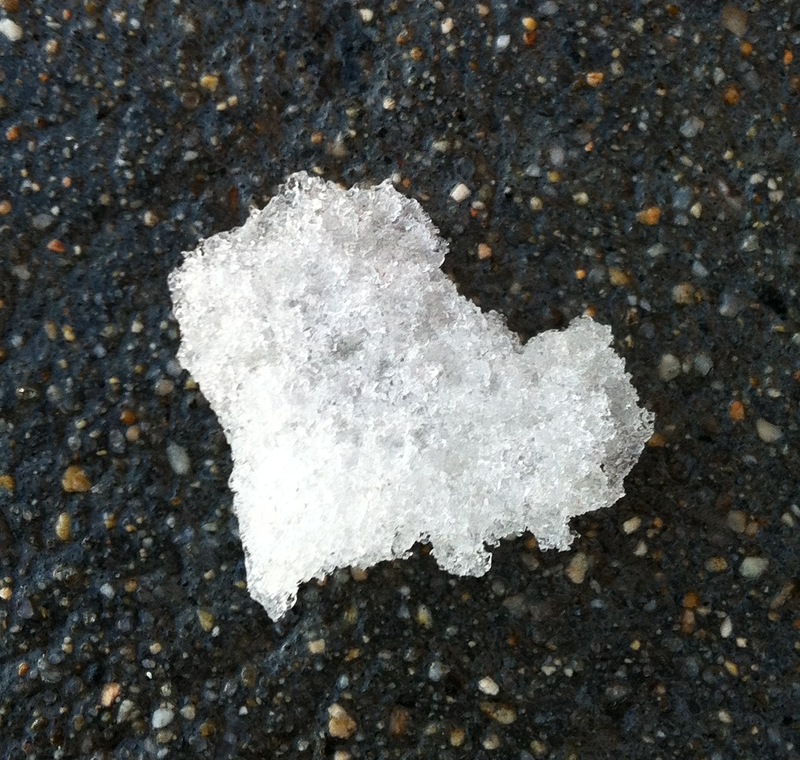 And I love it. This cake is a very simple, traditional yellow cake with chocolate frosting per request for Anthony’s birthday. Well, actually, he originally requested a “life-size castle cake” that he “could walk into,” but alas, that was not to be. Maybe when he graduates… Can you even imagine how much flour, sugar, butter, eggs, etc. you’d go through to make that?! Not to mention all the structural issues inherent in making walls and roofing out of cake. There would have to be lots of reinforcement (boards? wood? poles??) and “glue” (some super strong frosting?). I’m not quite up for that challenge, yet! Simple and classic it had to be. I found recipes on both Smitten Kitchen and Annie’s Eats that looked promising, and ended up going with Annie’s mostly because I had all the ingredients on hand. Just a few slight adjustments to try and make it extra moist, and I ended up with a nice medium-density: not too fluffy but definitely not heavy. The frosting was chocolatey, airy, and practically melting off the sides – I decorated this morning, so I never refrigerated it. Luckily, this “rustic” style of decorating (large swirly swoops of frosting) lent itself well for touching up melting sides. If you make this, keep it out of the sun and/or refrigerate it (although in the comments on Annie’s page, people mentioned issues where the frosting hardened too much in the refrigerator and wouldn’t soften even after it had been out for a while). 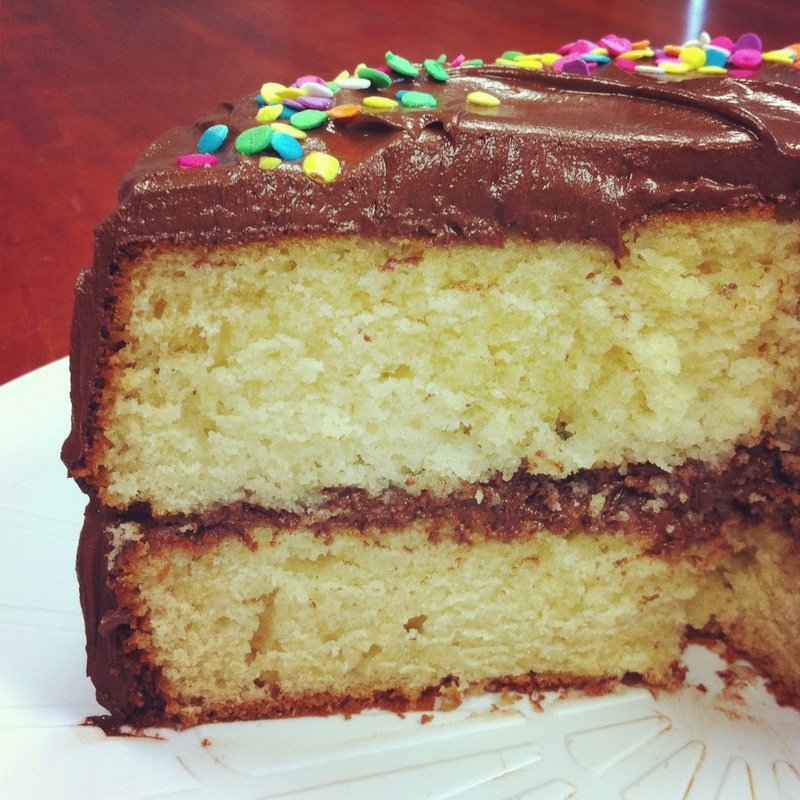 As for the taste, it’s good but not great: it’s a classic yellow cake with chocolate frosting. Hard to mess up, hard to fall in love with. At least in my, make-it-as-rich-as-possible mindset. Still, for what it is, it’s pretty delicious. Recipe slightly adapted from Annie’s Eats, originally from Baking Illustrated. 1. Preheat the oven to 350˚ F. Line the bottoms of two 9-inch round cake pans with parchment paper. Butter and flour the edges of the pans, tapping out the excess; set aside. 2. In a medium bowl, combine the all-purpose flour, cake flour, baking powder, and salt; whisk together and set aside. 3. In the bowl of an electric mixer, combine the butter and sugar. Beat on medium-high speed until light and fluffy, about 4 minutes, scraping down the bowl as needed. Mix in the eggs one at a time, beating well after each addition. Blend in the vanilla. With the mixer on low speed, add in the dry ingredients in three additions, alternating with the milk. Beat each addition just until incorporated, scraping down the sides of the bowl frequently. 4. Divide the batter between the prepared baking pans. Bake, rotating the pans halfway through baking, until the cakes are golden and a toothpick inserted in the center comes out almost clean, 35-40 minutes. Transfer the pans to a wire rack and let cool ~20 minutes. Run a knife around the edge of the pans to help remove the cakes. Invert the cakes onto the rack and peel off the parchment. Let the cakes cool completely before frosting. 1. Place the chocolate in a plastic, microwave-safe bowl and microwave for 1 1/2 minutes. Stir well until the chocolate has melted and is smooth; you may need to microwave for additional 10-15 second bursts, stirring each time. Set aside and let cool to room temperature, about 25-30 minutes. In a small bowl, combine the cocoa powder and boiling water; stir until the cocoa is dissolved and then set aside. 2. In the bowl of an electric mixer, beat the butter, powdered sugar and salt on medium-high speed until light and fluffy, 3-4 minutes. Add the room-temperature melted chocolate; beat on low speed until combined, 1-2 minutes. Beat in the cocoa mixture until well blended. You may need to let it cool longer before using it to frost if it’s too runny at this point. 1. Place one of the cake layers on a serving platter. Top with 1 cup of the chocolate frosting and smooth over the top of the cake. 2. Top with the second cake layer. Frost the top and sides of the cake with the remaining frosting as desired (I had some left over). 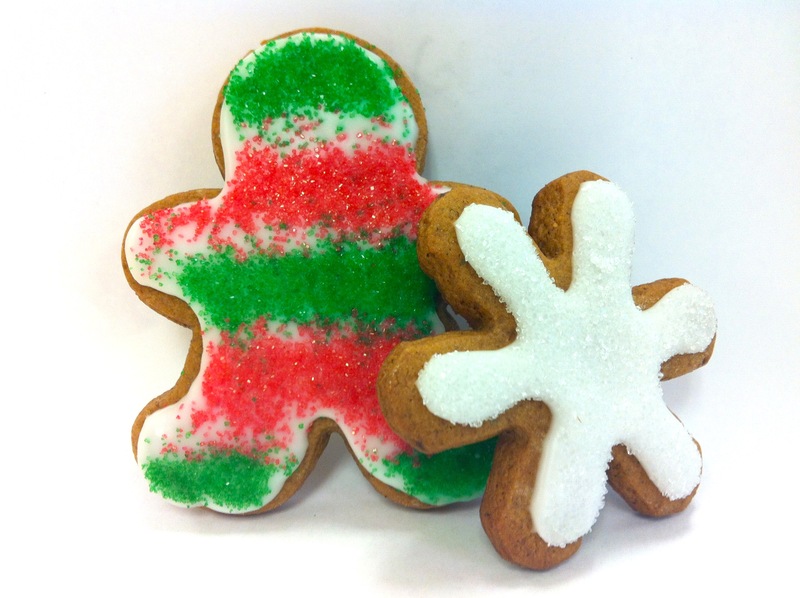 And of course, decorate with sprinkles if you like happiness! This is best if served the same day, but you can also keep it refrigerated, covered, for up to 3 days. Let the cake come to room temperature at least 30 minutes before serving. Lo and behold, I have some pretty darn amazing people in my life. Alex and her family helped me load and transport my larger pieces using the U-Haul they had rented. They were literally heaven-sent! I couldn’t have made it without them. Furniture moved, I now had to bring over all the “things” I left behind. 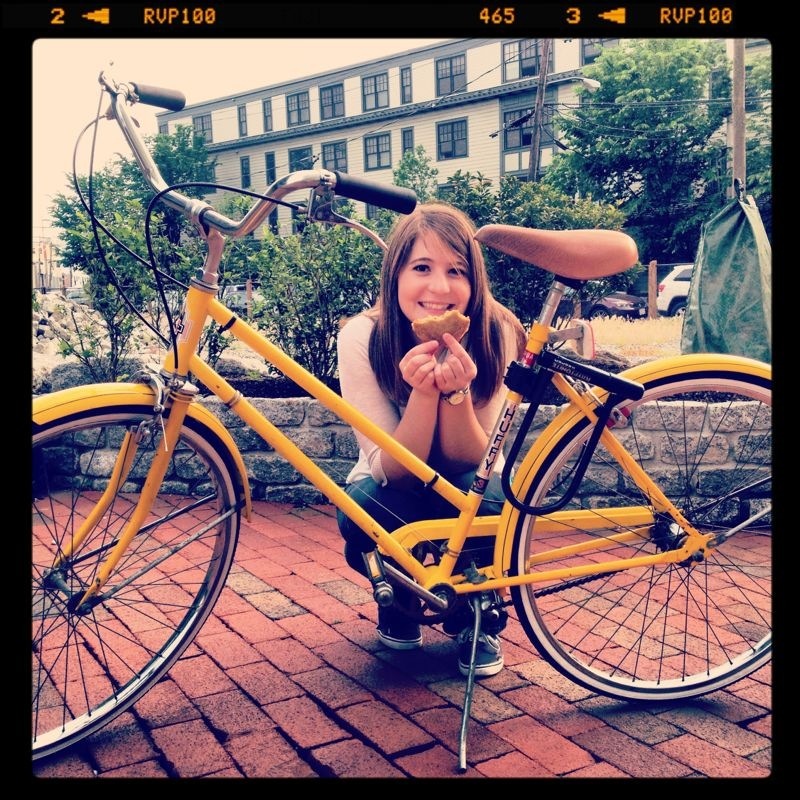 I didn’t have my bike yet, so I thought briefly about walking stuff over. I estimated I could finish within a week, if I never slept or took any breaks. The appeal factor for this plan was dismal. Luckily, Tommy (ZipCar member) and Dave came to my rescue. I packed up my stuff in bags and boxes, and we transported it to the new apartment… only to find that the elevator was broken. And of course my new place is on the top floor. Much laughter ensued as we carried everything up all four flights of stairs. And by “we” I mean “the boys,” because while I was carrying things like lamps and pillows, they were competing to see who could carry the most weight – and I’m pretty good at packing things to be obnoxiously heavy (hey! I wasn’t thinking that the elevator would break!). We mostly all agreed that, while both halves were delicious, the chocolate cake wins because it’s so over-the-top rich and moist. In fact, I’m tempted to make an entire cake of the chocolate side, because the “frosting” is more like a rich fudge ganache that blends seamlessly together with the cake to provide a death-by-chocolate sort of experience. 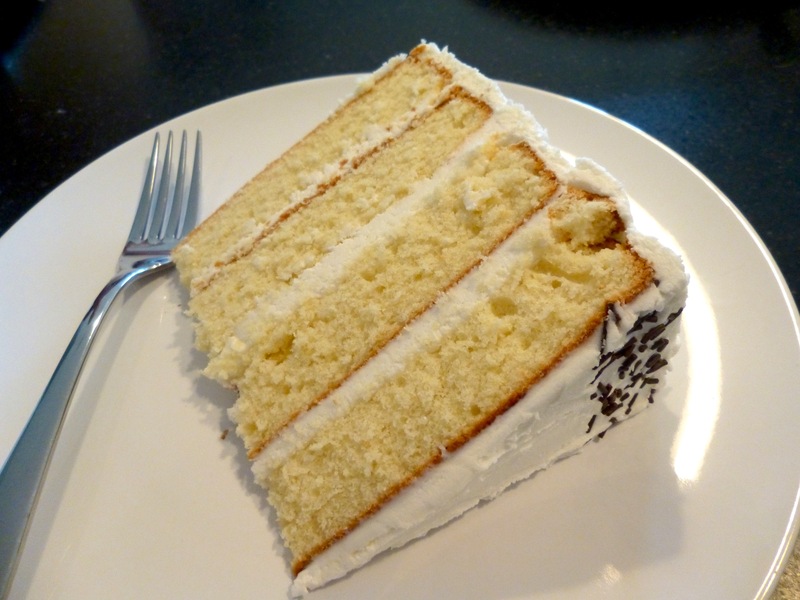 That is not to say the white cake side wasn’t good; it was soft and delicate as white cakes are, and the buttercream tastes like sugary goodness. But I accidentally overcooked the cake (still adjusting to the new oven and I’m convinced it runs too hot), so it bordered on being too dry. Watch your baking times carefully, and you’ll be sure to impress with a cake that pleases both sides of the chocolate vs. plain cake war! I recommend making the chocolate cake first; while it’s in the oven, make the chocolate frosting. This goes in the fridge to harden up. When your chocolate cakes come out of the oven, let them cool for at least 10 minutes before inverting them onto a cooling rack. Wash up your cake pans (if you don’t have four; if you have four pans, you can make the white cake while the chocolate one is in the oven) and get them ready for your white cakes. Make the white cakes and pop them in the oven. While they are cooking, put the chocolate cakes in the freezer and give the chocolate frosting a stir to make sure it’s cooling evenly. This is good time to tidy up the kitchen, because it probably looks like a science experiment gone wrong at this point in the process. When the white cakes come out, let them cool for about 10 minutes and then move them to wire rack and put them in the fridge to cool off a bit (they’re studier than the chocolate cake, so they don’t need to be placed in the freezer). Prepare your cake stand (put down strips of wax paper in a circle that you can remove after decorating – this prevents frosting and crumbs from getting all over your stand). Make the buttercream frosting. Remove the white cakes and cut them in half. Stack these, alternating cake layers with buttercream frosting. When the cake is fully stacked, slather the flat, cut side with a thick wall of buttercream (if the buttercream has “dried” a bit by this point, blend in some extra butter (softened) or milk to make it “sticky” again). Remove the chocolate cake and frosting. 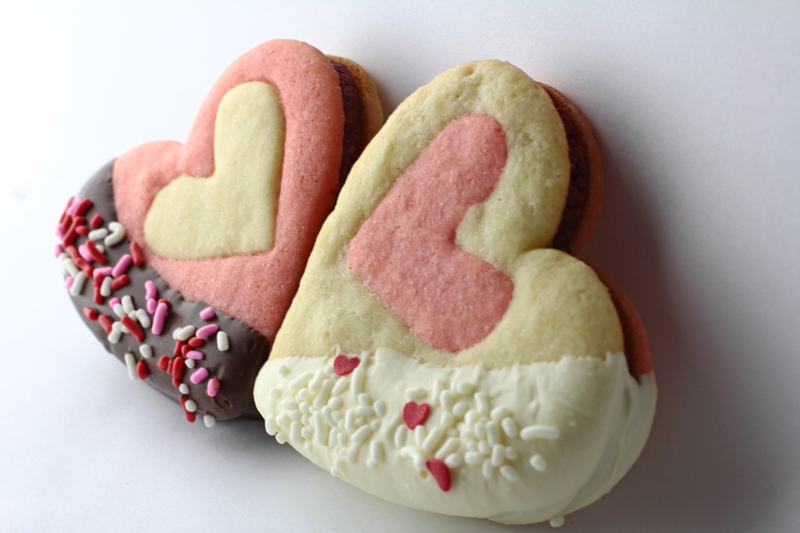 Stack these, pushing them against the wall of buttercream as you go. 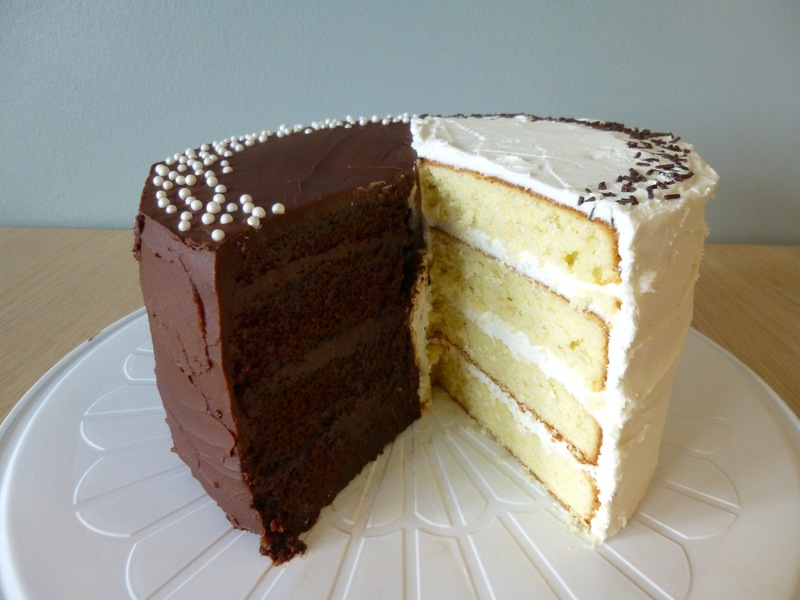 Alternate cake layers with chocolate frosting. You’ll have to cut the last half-circle so that it’s even with the white cake side (you don’t want your cake to be too lopsided!). Put the cake (now with the white and chocolate cake halves stuck together, but no frosting on the outside) in the fridge for 10 minutes. Remove the cake. Frost the chocolate side with the chocolate frosting, then frost the white side with the buttercream frosting (the buttercream is easier to work with and is thicker than the chocolate frosting, so it should go on second). Finish off with any decorations! 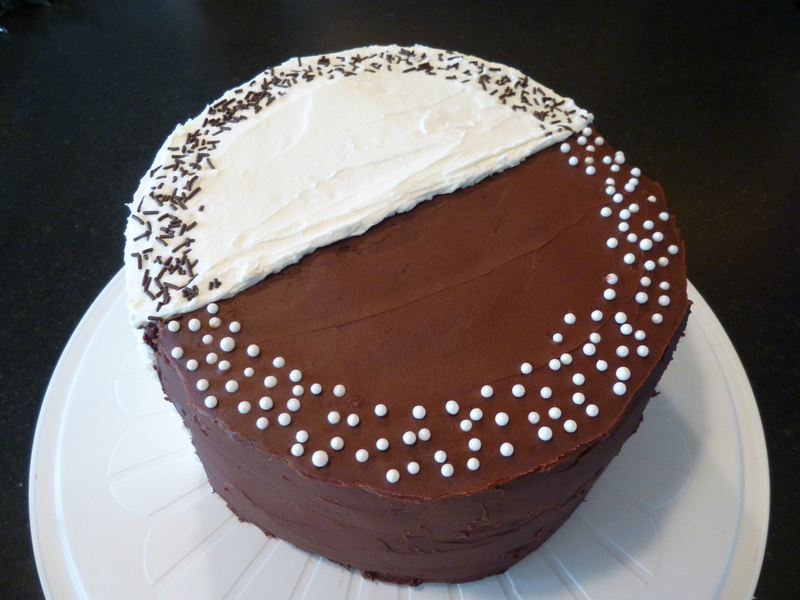 I used white and brown sprinkles on opposite sides of the cake to tie it together, but feel free to get creative! 1. Preheat the oven to 350 degrees F. Grease the bottoms and sides of two 9-inch round cake pans. Cut out a circle of parchment or waxed paper and line the bottom of each pan; grease the paper. Set aside. 2. In a large bowl, whisk together the flour, sugar, cocoa powder, baking soda, and salt. Add the oil and sour cream; whisk to blend. Gradually beat in the water. Blend in the vinegar and vanilla. Whisk in the eggs and beat until well blended. Scrape down the sides of the bowl and be sure the batter is well-mixed. Pour into the prepared cake pans, dividing evenly. 3. Bake for 30-35 minutes, or until a toothpick inserted in the center comes out almost clean. Let cool in the pans for 10-20 minutes. Invert onto wire racks, carefully peel off the paper liners, and let cool completely. Like Deb notes, these cakes are incredibly delicate. Put them in the freezer for half an hour to make your life infinitely easier. In fact, it’s going to be essentially impossible for you to make a layer cake out of these cakes if you don’t firm them up in the freezer. They’ll defrost once assembled, don’t worry. 1. Your oven should already be at 350 degrees F, but if you are doing this at a later time, preheat it now. Grease the bottoms and sides of two 9-inch round cake pans. Set aside. 2. In a large bowl, cream together the butter and sugar. Beat in the eggs, two at a time, and then stir in the vanilla. 3. Combine the flour and baking powder in a separate bowl and then gradually add to the creamed mixture until well-mixed. Blend in the milk. 4. Pour into the prepared cake pans, dividing evenly. Bake for 30-40 minutes (the recipe calls for 40-45; mine were done at 30 – it just depends on your oven, and I’m still adjusting to our new one), or until a toothpick inserted in the center comes out just barely clean. Let cool in the pans for 10-20 minutes. Invert onto wire racks and let cool completely. Put them in the fridge to cool even faster. 1. Starting with the white cakes, cut them in half so you have four half circles. Stack them, alternating cake layers with buttercream frosting. When the cake is fully stacked, slather the flat, cut side with a thick wall of buttercream (if the buttercream has dried a bit by this point, blend in some extra butter (softened) or milk to make it “sticky” again). 2. Next, work with the chocolate cake. Cut them into half circles, and stack them, alternating cake with frosting. This time, though, push each layer against the wall of buttercream as you go. You’ll have to cut the last half-circle so that it’s even with the white cake side (you don’t want your cake to be too lopsided!). 3. Put the cake (now with the white and chocolate cake halves stuck together, but no frosting on the outside) in the fridge for at least 10 minutes. Remove and frost the chocolate side with the chocolate frosting, then the white side with the buttercream frosting (the buttercream is easier to work with and is thicker than the chocolate frosting, so it should go on second). Finish off with any decorations you like. 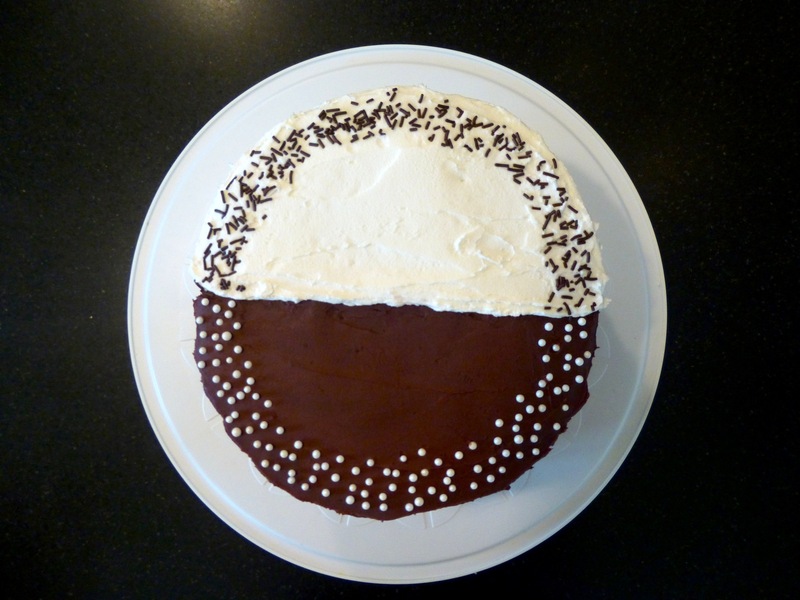 I used white and brown sprinkles on opposite sides of the cake to tie it together, but feel free to get creative! Well, hello there! So good to see you again. 1) The past few months were utter insanity. I didn’t have time to bake, or when I did, it was simple chocolate chip cookies so I didn’t bother sharing with y’all. 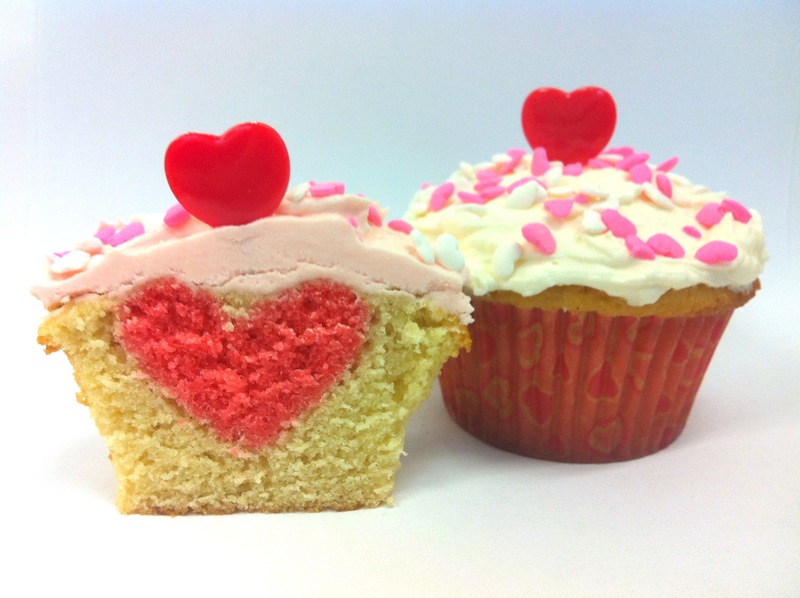 It was rough: I was so stressed, I couldn’t spare any time to bake. 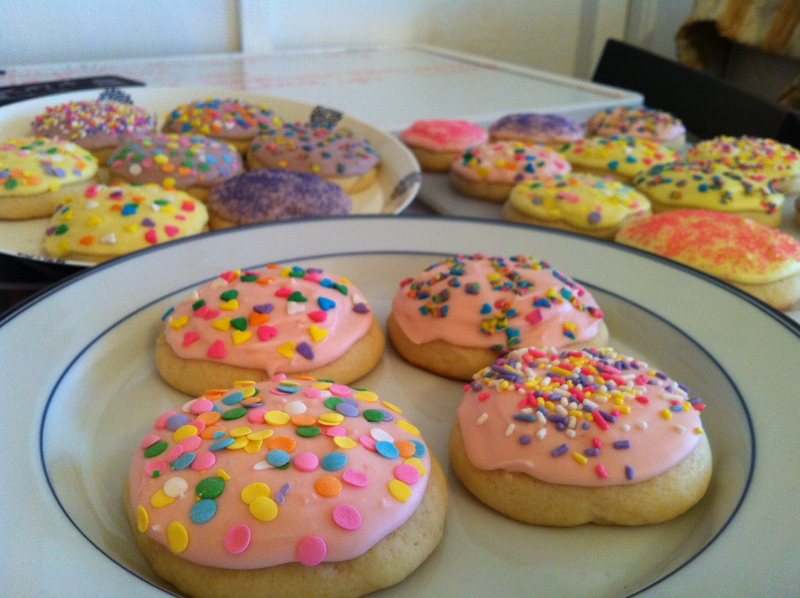 But because I wasn’t baking, I didn’t have a way to properly relax and release stress, so the stress just compounded. Not a fun cycle. 2) I moved! This new place? There are no words to describe its perfection. 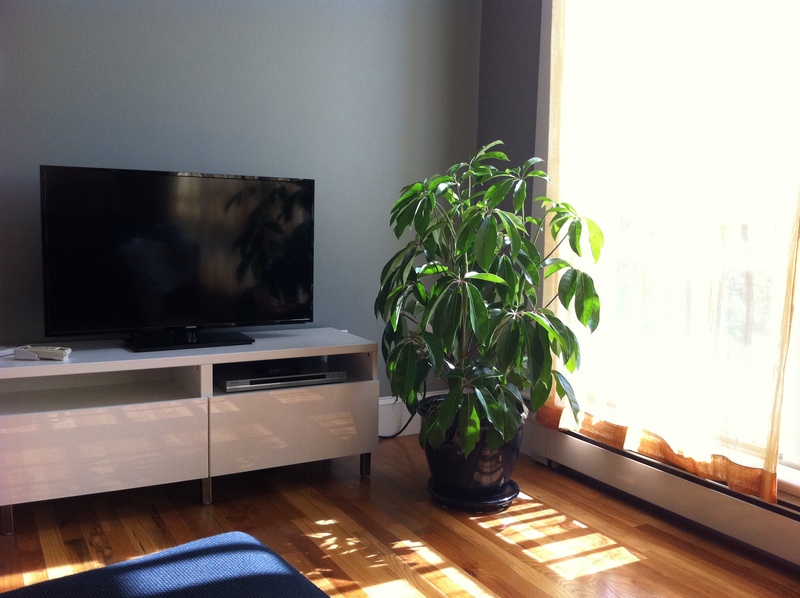 Huge and spacious, 2 bedroom/2 bathroom (I HAVE MY OWN BATHROOM!! ), a private patio deck facing west with killer sweeping sunset views (and coincidentally, looking toward California – lest I forget my return plan! ), floor-to-ceiling windows in the living room, beautiful wood floors, a ginormous closet (I could sleep in there comfortably), and a kitchen that is drool-worthy. I’ll post a picture sometime so you can see how glorious it is! Drooling yet? I am. But then again, I have a full-blown addiction to sprinkles. 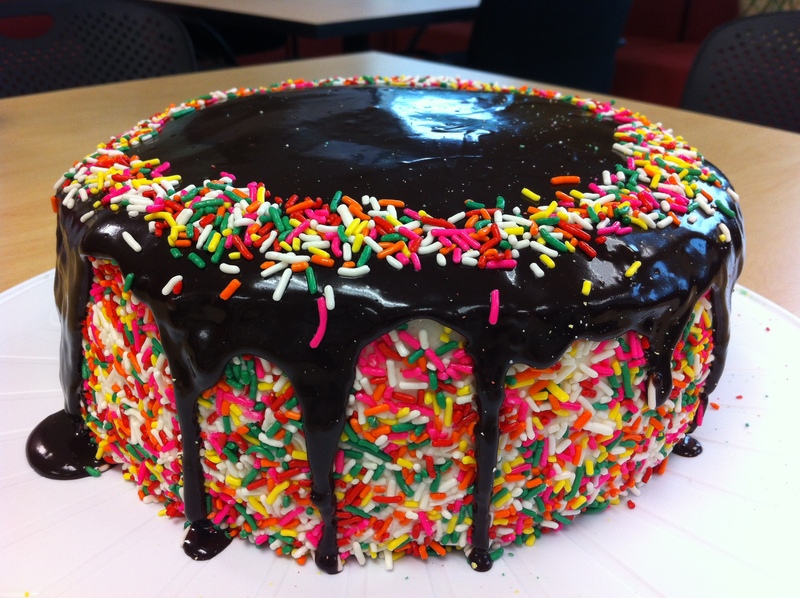 So when I noticed a giant jar of sprinkles on the “free” table in the kitchen, I snatched them immediately and began dreaming up this cake. 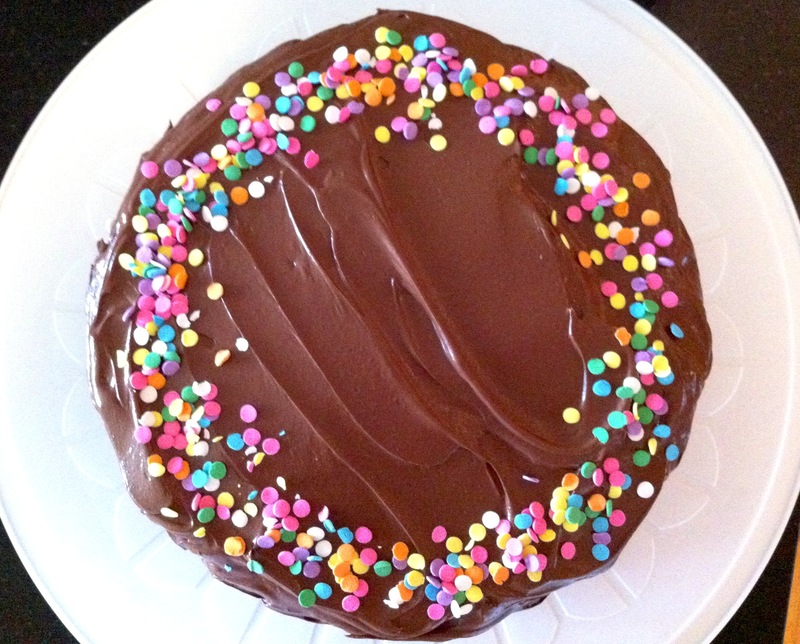 What resulted is a beautiful, deceptively simple, and delicious cake: my favorite chocolate cake + buttercream frosting + chocolate ganache + loads of colorful sprinkles? Yes. I’ll have a huge slice, thankyouverymuch. By the time I remembered to take a “slice” photo, there was barely any cake left. THAT is how tasty this cake is! I’m not going to wax poetic here. This cake needs no justification. Either you adore sprinkles (like me) and will make this purely because LOOK AT IT, or you don’t care for sprinkles and you’ll simply click away from this recipe. Either response is fine. 1. Preheat the oven to 350 degrees F. Grease the bottoms and sides of three 8 or 9-inch round cakepans. Cut out a circle of parchment or waxed paper and line the bottom of each pan; grease the paper. Set aside. 2. In a large bowl, whisk together the flour, sugar, cocoa powder, baking soda, and salt. Add the oil and sour cream; whisk to blend. Gradually beat in the water. Blend in the vinegar and vanilla. Whisk in the eggs and beat until well blended. Scrape down the sides of the bowl and be sure the batter is well-mixed. Pour into the prepared cake pans, dividing evenly among all three. 3. Bake for 30-35 minutes, or until a toothpick inserted in the center comes out almost clean. Let cool in the pans for about 20 minutes. Invert onto wire racks, carefully peel off the paper liners, and let cool completely. Like Deb notes, these cakes are incredibly delicate. Put them in the freezer for half an hour to make your life infinitely easier. In fact, it’s going to be essentially impossible for you to make a layer cake out of these cakes if you don’t firm them up in the freezer. They’ll defrost once assembled, don’t worry. 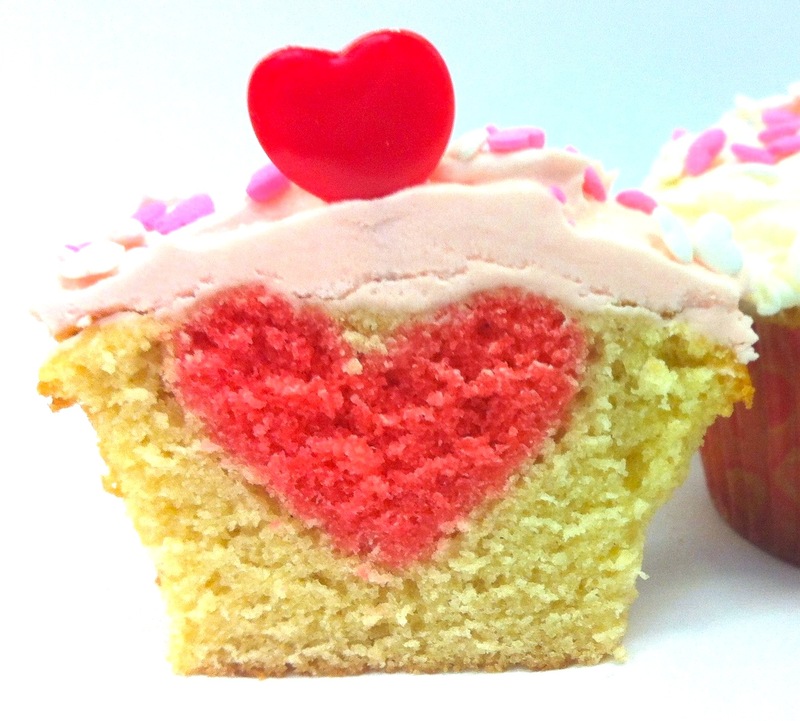 In a stand mixer, beat together 1 cup of the sugar and softened butter. Mix on low speed until well blended, gradually adding the rest of the sugar. Increase speed to medium and beat for another 3 minutes. Add vanilla extract and cream; continue to beat on medium for 1 minute more, adding extra cream or powdered sugar to reach a spreading consistency. NOTE: Do not make this until you are ready to pour it on top. You’ll want to pour this while it’s still warm, so wait until you’re ready for it. 1. Place one round of cake on your cake tray or stand (set it on top of wax paper strips so you can remove these at the end and have a clean stand!). Spread frosting on top, pushing it all the way to the edges. Repeat with the other two rounds. Coat the entire cake in a thin layer of frosting (aka a crumb coat) and put the cake in the refrigerator for 10-15 minutes. When the crumb coat has hardened a bit, pull the cake back out and generously coat it with the remaining frosting. 2. Pour a bunch of sprinkles in your hand, and then gently press them all over the sides of the cake (not on top – that’s going to be covered with chocolate ganache). I used an upward sweeping motion, starting at the bottom with just the edge of my hand and slowly moving my hand up the cake, tipping more sprinkles against the cake as I moved up. Wash your hands as needed to keep them from getting covered with frosting. 3. 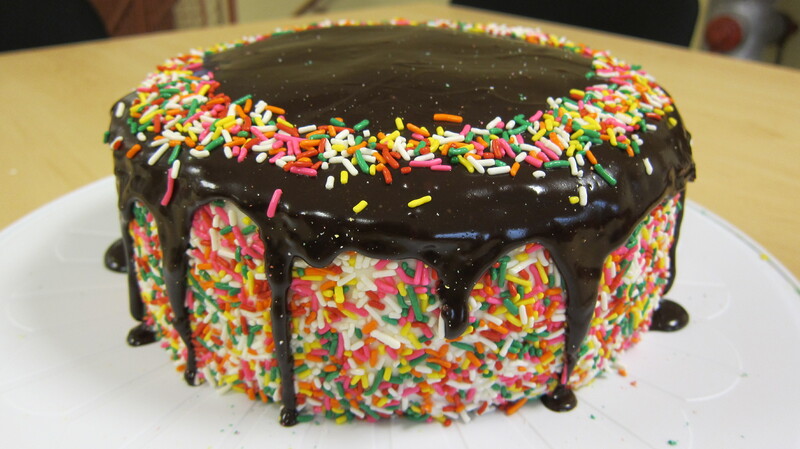 When the cake sides are covered with sprinkles, make the ganache. Let it cool a little; while it’s still warm, carefully pour it over the top of your frosted cake. Gently push small sections of the chocolate off the top so it drips down the sides in long lines. Take any remaining sprinkles you have and decorate the top with them (as you can see in the photo above, I made a circle). And that’s it! You now have a very festive, fun cake perfect for birthdays (what this one was used for) or graduation or anything else you want. You could even vary the cake or sprinkles to fit the mood (perhaps red, white, and blue for the upcoming Fourth of July?). Let me know if you find a creative way to dress up this cake! Enjoy!! A fellow grad student in my department asked if I could make my own peeps for Easter. 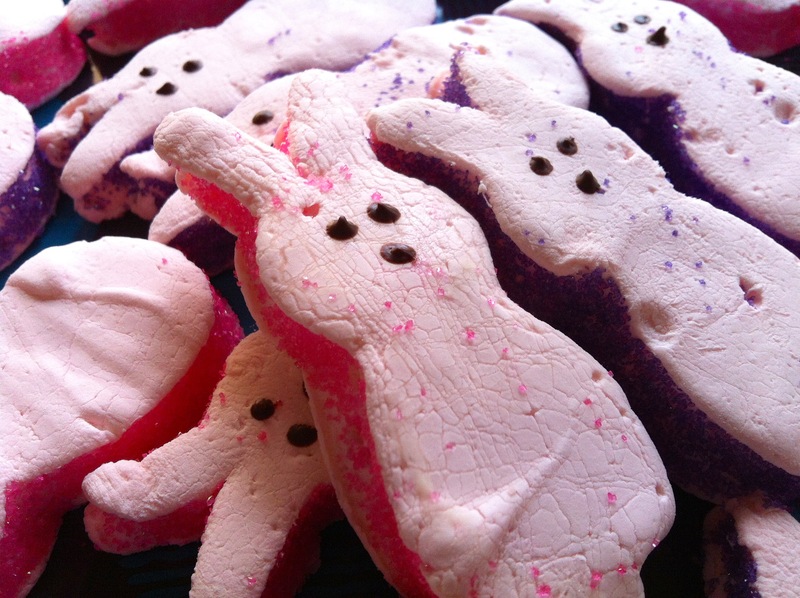 I used this simple marshmallow recipe from Smitten Kitchen, originally from Gourmet 1998, and added a bit of red food coloring to make them pink. I also divided the marshmallows between the pan size she calls for and a smaller (about 5×7-inch) pan because I didn’t want the marshmallows to be too thick. To make sure I got the look just right, James made a special bunny cookie cutter for me. 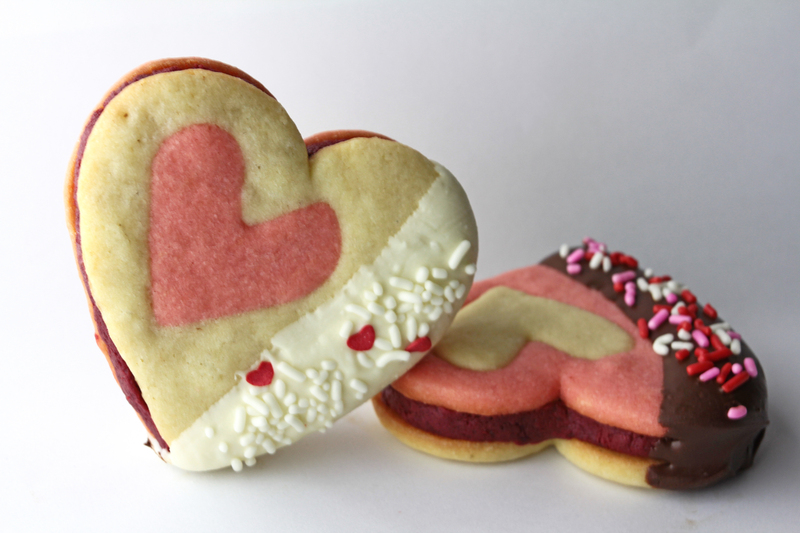 This is the same guy who made the heart cookie cutter for Valentine’s Day; crazy talented, right?! 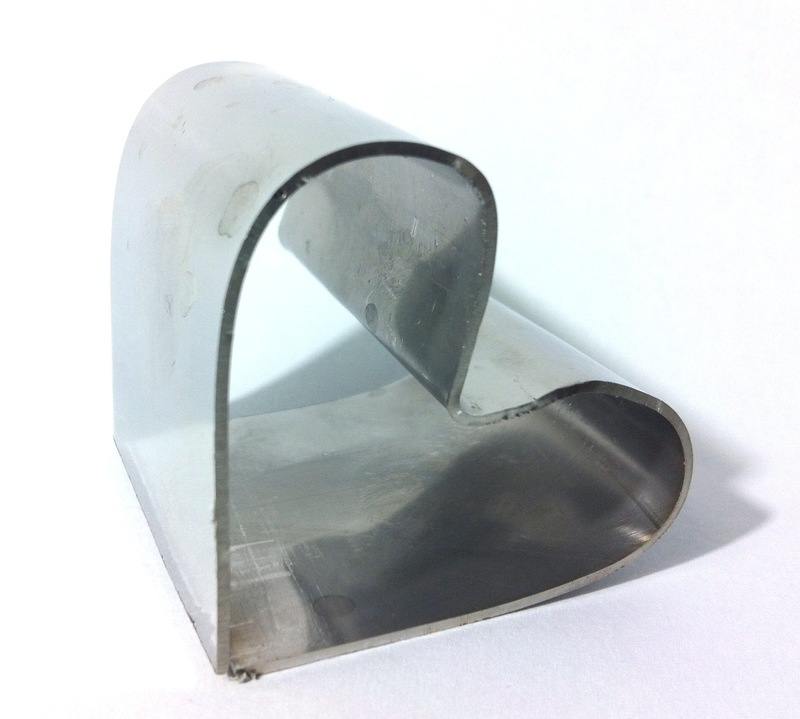 If you don’t have an equally remarkable labmate with impressive machine shop skills, I’m really sorry. You’re missing out. 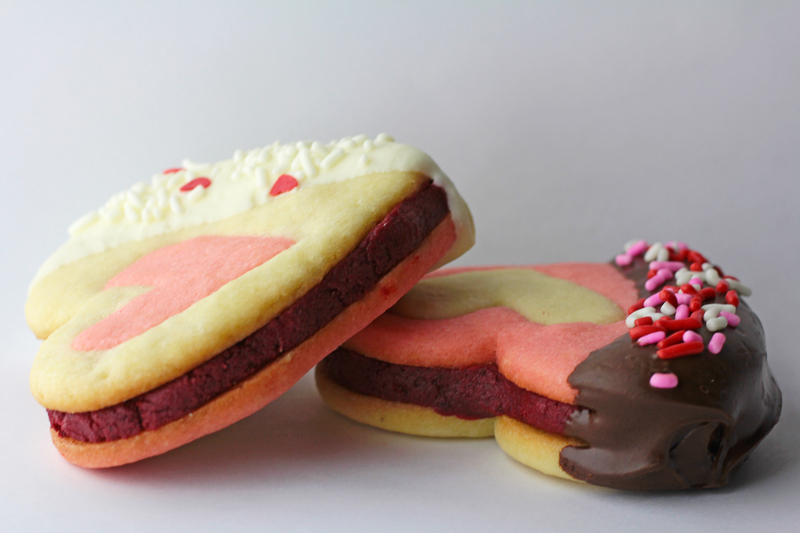 You’ll have to find a bunny cookie cutter somewhere or use a different shape. 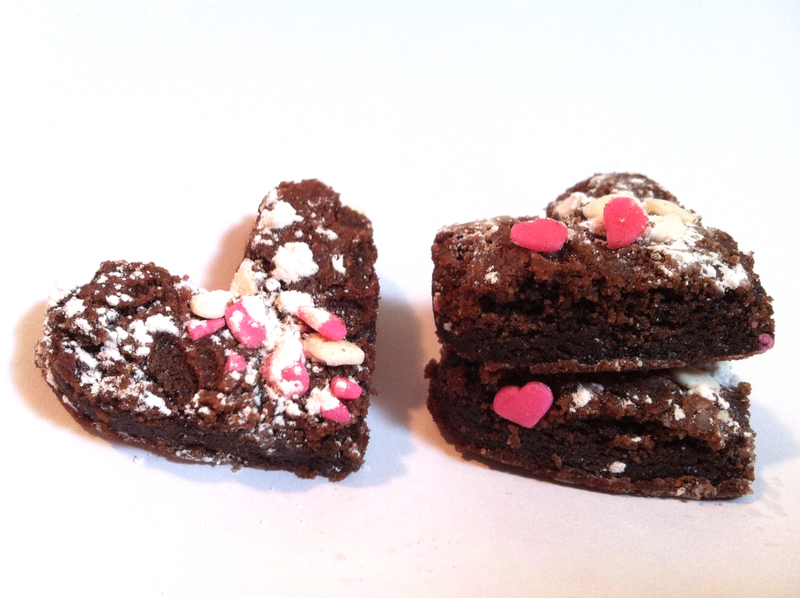 Hearts for Valentine’s Day? Clovers for St. Patrick’s Day (green food coloring, of course)? Red and blue and white stars for Fourth of July? Orange pumpkins for Halloween? The possibilities are endlessly intriguing. 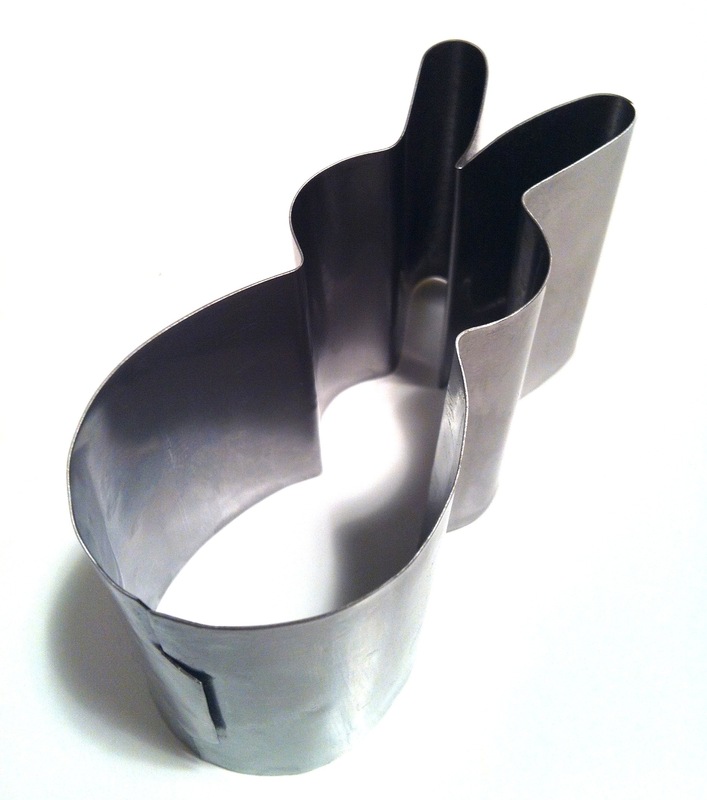 Conversely, we could see if James is interested in a side business selling custom cookie cutters… That is, assuming I’m willing to share my cookie cutter-making virtuoso. Big assumption. Look at that seam… I have no idea how he does it, but I’m not going to question the wizardry so long as it keeps producing this sort of magic! Finally, dip a toothpick in melted chocolate to dab on eyes and a nose. Cute, cute, cute! It’s so easy, I’m not going to give you the recipe – follow the Smitten Kitchen link to make the marshmallows and then come back here for directions on how to do the rest. 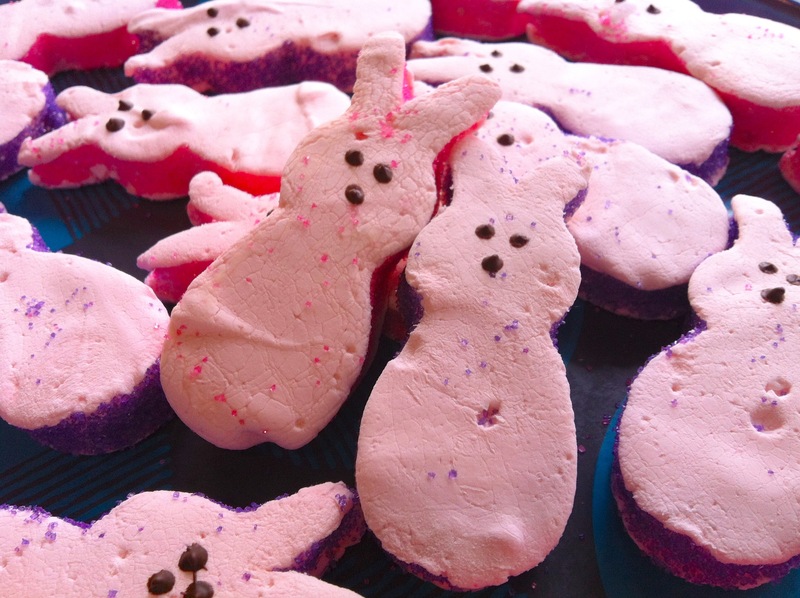 Soft, fluffy, and sugary homemade marshmallow peeps? That completely blow regular, plastic-y peeps out of the water? Done and done. No more store-bought peeps for moi! I hope you all had a lovely Easter. 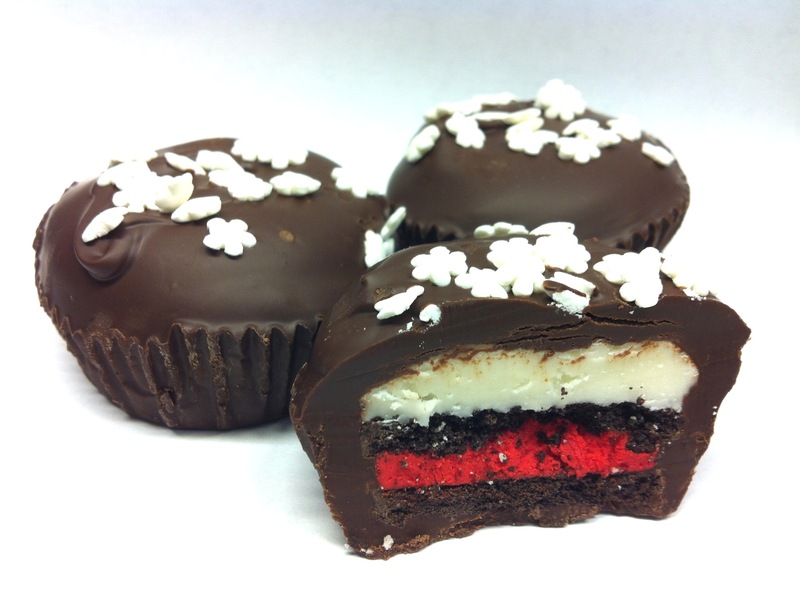 And please let me know if you try a different holiday or celebration version of these!